Raising any caterpillar to watch the life cycle is a rewarding, educational experience. Woolly Bears are cute & fuzzy caterpillars that are active this time of year, making them easy to find. And they’re quite easy to raise! Here’s your how-to guide for caring for a Bear! It’s not hard to find a Woolly Bear: they love weeds like dandelion and goldenrod which are abundant in this area. You may even see one crossing the street, don’t feel ashamed to stop the car and go collect the Woolly Bear (of course doing so safely). We brake for Woolly Bears all the time! Use a terrarium or container that has holes or mesh for a lid, and make sure the container is big enough for the Bears to wander around. Put 1/2 – 1″ of soil in the bottom and keep it evenly moist (but never wet). Keep the terrarium outside, at least at night (read on to find out why). Woolly bears are not picky eaters. You can feed them the leaves of almost anything you’d call a weed, like dandelion, plantain, burdock, goldenrod, etc. Add more food regularly (every 1 – 2 days), and clean out the caterpillar frass (aka poop) as it collects. If you’re keeping the terrarium outside at least at night, the Bears will naturally stop eating and begin to hibernate on their own. After the temperatures stay cold enough that your Bear stops waking up, take out all old food and stop feeding. Add some fallen leaves or small pieces of wood that your Bear can curl up under. 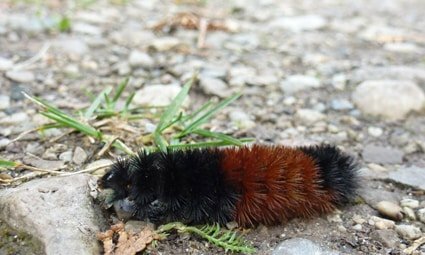 Your Woolly Bear will want to sleep undisturbed in a cold spot all winter long. Remember, it needs to stay outside! It may seem harsh to leave it out in the cold, but that’s what your Woolly Bear needs. Check on your Bear periodically to make sure the container and the contents stay moist. Keeping the container outside helps with this, but if it does get dry you can occasionally mist the terrarium. When the temperatures go up your Bear will begin to wake up so you need to start feeding it again. Keep feeding your bear until it stops eating on its own. 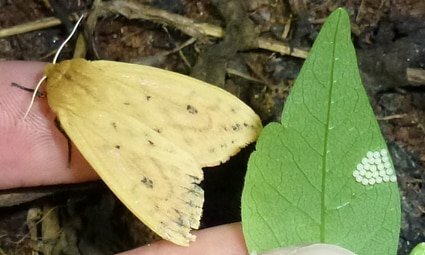 Eventually the caterpillar will make a fuzzy cocoon, and in 2-3 weeks it will emerge as a lovely Isabella Tiger Moth! Check the terrarium frequently and be sure to release the moth after it emerges and dries its wings. CLICK HERE for more information on Woolly Bear Weekends!